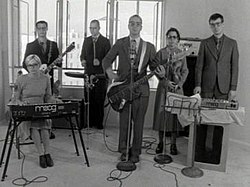 The Rentals that performed on "Return of The Rentals" in the "Friends of P." music video. The Rentals are an American rock band fronted by vocalist Matt Sharp, best known as the former bassist for Weezer. Sharp has been the only consistent member since the group's inception. The band's best selling single is "Friends of P" (1995). The Rentals released two albums, Return of the Rentals (1995) and Seven More Minutes (1999) on Maverick Records before quietly splitting in 1999 following a world tour. The group reformed in 2005 and have since released several EPs and a third full-length album, Lost in Alphaville, which was released August 26, 2014, on Polyvinyl Records. Numerous musicians have appeared with the group on recordings and in live shows. The group's most recent iteration consists of Sharp, Nick Zinner, and Ronnie Vannucci Jr. The group is known for their quirky, Moog-driven melodies and a mix of male and female vocals. Their first single, "Friends of P.", from their debut album, Return of the Rentals, was a modern rock radio hit, peaking at number 7 on Billboard's Modern Rock Chart and number 82 on the Billboard Hot 100. The accompanying music video was shot with antiquated equipment, on black and white film stock, with a total budget of less than $1,000. Upon its release, the video was added to MTV's playlist in early November 1995. Early next year, "Waiting" was released as the follow-up single, and it was also chosen to be featured on the soundtrack to the MTV Films comedy Joe's Apartment. The music video that had already been shot for "Waiting" was edited together with clips of footage from the movie, and this version made its debut on 120 Minutes. Both versions of the music video were eventually released and can be viewed on video websites like YouTube. Band members on Return of the Rentals included Patrick Wilson (also of Weezer) on drums, Rod Cervera (guitar), Tom Grimley (keyboards), Petra Haden (violin, vocals), and Cherielynn Westrich (vocals, Moog). Petra's triplet sister Rachel Haden appears as an additional vocalist. After Sharp left Weezer, Wilson's studio replacement on the drums was Kevin March, and Mike Fletcher was the band's most frequent touring drummer. Maya Rudolph, of Saturday Night Live fame, also handled keyboard and backing vocals for the group's first tours in support of its debut album. The group headlined its own club shows, and also hit larger venues, as the opening act for such well-established acts as Alanis Morissette, Garbage, Blur, and the Red Hot Chili Peppers. Sharp reformed The Rentals in 1997 and 1998 to record their second album, Seven More Minutes. He recruited Petra Haden to replace Cherielynn Westrich as the main female vocalist, and Jim Richards replaced Tom Grimley on Moog synthesizer; Kevin March was again on drums and Rod Cervera on guitar. Maya Rudolph made a guest appearance on two songs. Members of Blur, Ash, Elastica, and Lush also made guest appearances. The album was released in April 1999. It was well received by fans and critics, but The Rentals' record company, Reprise and Maverick, didn't properly promote it due to disagreements with Sharp on the mixing. Sharp formed a completely new lineup, including former Elevator Drops guitarist Josh Hager (a.k.a. Garvy J), replacing Rod Cervara, for a brief tour of Japan. The Japanese tour consisted of an acoustic set featuring no Moogs or female harmonies and then an electric set. This tour resulted in the Internet-only double live album Live in Japan. Sharp retreated with Josh Hager and former Cake guitarist Greg Brown to Leipers Fork, Tennessee, to record a solo album of acoustic material, much like the acoustic sets in The Rentals' 1999 Japanese tour. These sessions resulted in an EP and an album in 2003 and 2004, respectively. Acoustic tours also occurred in 2002–05, sometimes with Hager and Brown, sometimes with just Sharp, and sometimes with the band Goldenboy. These shows were characterized by an intimate environment, with Sharp often inviting the audience to bring pillows or to sit in a circle on stage with him for the duration of the concert. On October 24, 2005, the tenth anniversary of the band's first album's release, Sharp announced he was bringing back The Rentals after a six-year absence. The band toured North America in the summer of 2006 with Ozma. Ryen Slegr of Ozma played guitar for both bands on the entire tour. The Rentals' lineup included original backup vocalist Rachel Haden on vocals and bass, Sara Radle on vocals and multiple instruments, Ben Pringle (from Nerf Herder) on synths and trombone, Lauren Chipman on viola and vocals, and Dan Joeright on drums. The tour featured a performance of the Weezer B-side "I Just Threw out the Love of My Dreams" by Sharp and Haden. On August 14, 2007, the group released their first new material in eight years, a collection of home recordings called The Last Little Life EP. The latter includes a reworked version of "Sweetness and Tenderness". The band also announced a headlining US summer 2007 tour to coincide with the release of the new EP. The band played at Spaceland every Saturday in July before embarking on a nationwide tour in August. The bands Copeland and Goldenboy opened. In June 2008, Sara Radle announced her departure from the group to focus on her band Calamity Magnet. On September 27, 2008, The Rentals released a new song titled "Colorado" on the band's official website. Photographs About Days — 365 photographs plus one roll of undeveloped film shot each day by Sharp. Films About Weeks — 52 short films with music and scores exclusive to the films. Songs About Time — three mini-albums released in April, July and October as digital downloads. At the end of the year, the band released a limited deluxe edition box set of the project, available both as compact discs and 180-gram vinyl records. Also, one of the 365 rolls of film was added to the first 365 orders of the box set. On April 7, 2009, the first mini-album from Songs About Time was released, featuring Joey Santiago of The Pixies as a guest performer. The group's second EP in the Songs About Time series, entitled Time To Come Home, was released on July 7, 2009. The third EP in the series, The Future, was released on October 20, 2009. On April 12, 2011, The Rentals released an album entitled Resilience. This was (as their official website states) originally recorded as part of the Songs About Time project, as accompanying music to the 'Films About Weeks' videos. The album was originally titled Tokyo Blues but renamed Resilience as a commentary on the band's perception of the character and resilience of the Japanese people after the Japanese tsunami and earthquake disaster. The band played both dates of the 2011 Nano Mugen festival in Japan. Sharp and Chipman were joined by members of the bands Ash and We Are Scientists. In November 2013, Sharp confirmed via Twitter and Instagram that Dave Sardy was mixing their third album, the first full-length LP since 1999's Seven More Minutes. On December 5 of that year, Polyvinyl Record Co. announced that it would release the album in 2014. The album featured a new lineup of Sharp, Chipman, Jess Wolfe and Holly Laessig of Lucius, Ryen Slegr of Ozma, and Patrick Carney of The Black Keys. On June 6 it was revealed that the album would be titled Lost in Alphaville and set for release on August 26. The single "Thought of Sound" was released on June 6. Sharp, Chipman, Slegr and a lineup of touring musicians including Nedelle Torrisi, Keith Murray of We Are Scientists, Shawn Glassford of Starfucker and Jared Shavelson toured in support of the album in the fall of 2014. On March 9, 2015, Sharp announced a full U.S. tour in May and June 2015, featuring a lineup of Sharp, Chipman, Slegr, Glassford, Ted Gowans (Tegan and Sara) and Patti King and Lizzy Ellison of Radiation City. On October 4, 2017, Sharp announced that he had started work on The Rentals' fourth studio album with a potential release date in the first half of 2018. "The new record is a collaboration between myself, Nick Zinner and Dave Fridmann with a little help from a makeshift choir of incredible singers that I affectionately like to refer to as The Gentle Assassins." In the same announcement he revealed the new song "Elon Musk Is Making Me Sad" which was shared with the help of Wired. The song was officially released at midnight on October 5, 2017. Sharp tweeted about the album's completion on December 20, 2018, also announcing the current iteration of The Rentals consists of him, Nick Zinner, and Ronnie Vannucci Jr..
1995 Return of the Rentals Maverick/Reprise/Warner Bros.
1999 Seven More Minutes Maverick/Warner Bros.
2014 Lost in Alphaville Polyvinyl Record Co.
2011 Resilience (AKA Songs About Time: Chapter Four: Tokyo Blues [Instrumental]) Ernest Jenning Record Co.
^ "The New Friend of P". Dallas Observer. October 22, 2006. Retrieved October 13, 2014. ^ "onlyrawkin". Last.fm. Retrieved October 13, 2014. ^ "Colorado". Weezerpedia.com. Archived from the original on October 17, 2014. Retrieved October 13, 2014. ^ "The Rentals Present Resilience | A benefit album for the Japanese Relief Effort". Therentals.com. Retrieved 2011-08-07. ^ "Artist | NANO-MUGEN FES.2011 | English". Nano-mugenfes.com. Retrieved 2011-08-07. ^ "The Rentals Facebook Page". Facebook. Retrieved 2011-08-07. ^ Davies, Alex (October 4, 2017). "Elon Musk Finally Gets the Melancholy Theme Song He's Always Needed". Wired.com. Retrieved March 9, 2019. ^ Sharp, Matt (December 20, 2018). "the final frontier, last day @sterlingsoundpic.twitter.com/GO1QwPQhj0". Twitter. Retrieved March 9, 2019. ^ "Return of the Rentals - The Rentals". AllMusic. Retrieved 2012-02-19.